At our coal wagon tipplers, some quantity of remnant material is left inside the wagons post tippling. The remnant coal inside the wagons has to be cleaned manually, which involves a lot of manpower. To do the cleaning activity, cleaning people have to move inside and out of the tippled empty wagons at the outhaul area of tippler while empty wagons are getting pushed. This activity of manual cleaning of unloaded wagons has to be done while the unloading process is going on at tippler and is a very hazardous activity. Around 30 to 50 T of spillage coal is generated on an average per day due to remnant coal in wagons which doubles during monsoon. 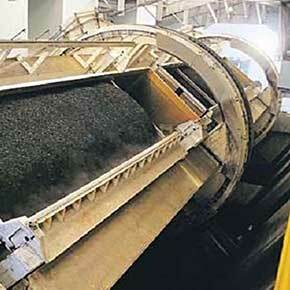 The remnant coal of different rakes is accumulated after cleaning which gets converted into mix spillage coal and is a loss of prime domestic and imported coals.